Cover art for “Artemis,” the new novel by “The Martian” author Andy Weir, out Tuesday, Nov. 14, 2017 by Crown Publishing Group. 20th Century Fox has chosen movie writer Geneva Robertson-Dworet to adapt Andy Weir's "Artemis," an action-packed crime caper set on an isolated moon base. Robertson-Dworet is also writing the screenplay for the "Captain Marvel" movie, scheduled to be released in 2019, according to a new report from Deadline.com. Phil Lord and Chris Miller, known for "21 Jump Street" (2012) and "The Lego Movie" (2014), are set to direct, the report added, and Simon Kinberg and Aditya Sood will produce the movie for Fox and New Regency. "Artemis," which Weir published late last year, follows the lunar native (and smuggler) Jazz Bashara after she gets the job of a lifetime. An audiobook version of the novel, narrated by Rosario Dawson, was released simultaneously. Weir is known for his scientifically detailed novel "The Martian," which came out as a movie in 2015 starring Matt Damon. 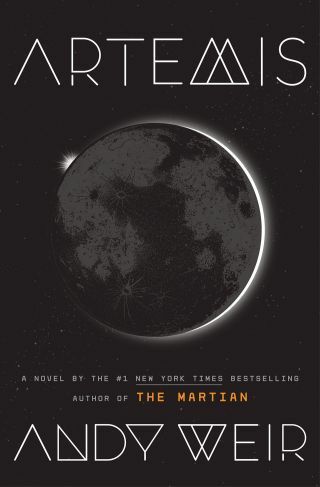 "Artemis," too, shows Weir's eye for world-building and detail — from the economics of a moon base to the subpar coffee that brews at one-sixth Earth's gravity. The movie version will no doubt have that same sense of place — hopefully with a stronger eye for character to bring the narrative to the next level.